Welcome to HKUST VisNexus, a research project of visualization group, VisLab, at the Department of Computer Science and Engineering, Hong Kong University of Science and Technology. We dedicate to exploring diverse topics that help to address the needs in understanding complex relations among various data entities with novel and insightful visualization and analysis techniques. With the burgeoning development of information technologies, numerous data of different categories have become accessible to us. Analyzing the relations among data entities provides new opportunities to reveal the hidden information in data and better understand our world. Visualization techniques enable people to leverage the power of human cognition to analyze the relations among objects and data entities in real world scenarios. However, it is still challenging to develop efficient and effective visualization methods in large and complex data. 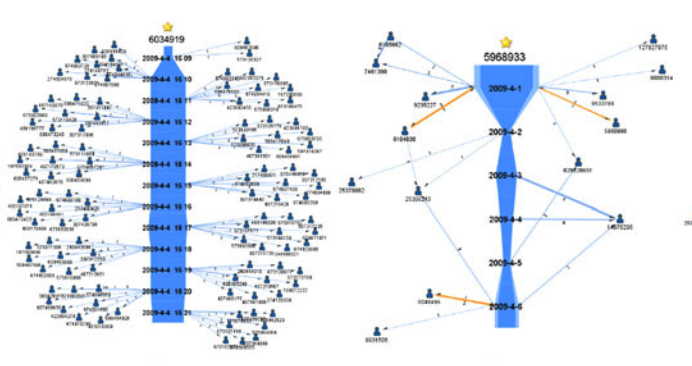 Network structures are commonly existed in many different scenarios such as social networks, financial transaction networks, biological networks, and others. However, common visualizatoin methods always encounter the scalability problem when the graph size increases. We provide various solutions helping people better understand graphs. We present a technique that highlights common types of visual ambiguities: ambiguous spatial relationships between nodes and edges, visual overlap between community structures, and ambiguity in edge bundling and metanodes. 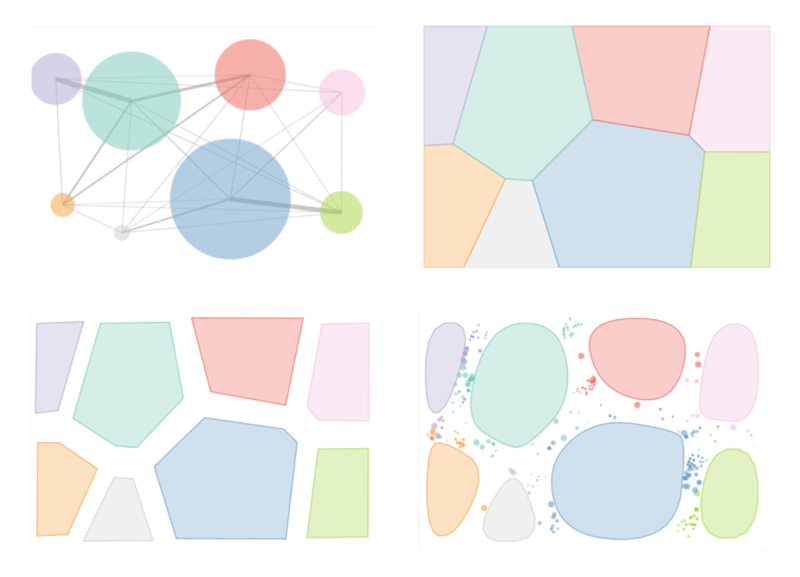 We present an interactive visualization method based on the Voronoi treemap to reveal the major communities and their relationships in a large network. It provides a novel approach to help people understand community characteristics and investigate various relation patterns between communities. 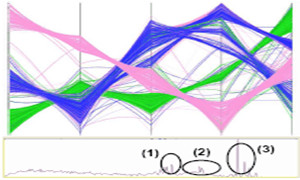 We present an efficient mesh-based edge clustering method for graphs. We introduce different control mesh generation techniques that can capture the underlying edge patterns and generate informative and less cluttered layouts. We propose a novel controllable edge clustering method based on Delaunay triangulation to reduce visual clutter for node-link diagrams. We further introduce progressive edge clustering to achieve continuous level-of-details for large networks. 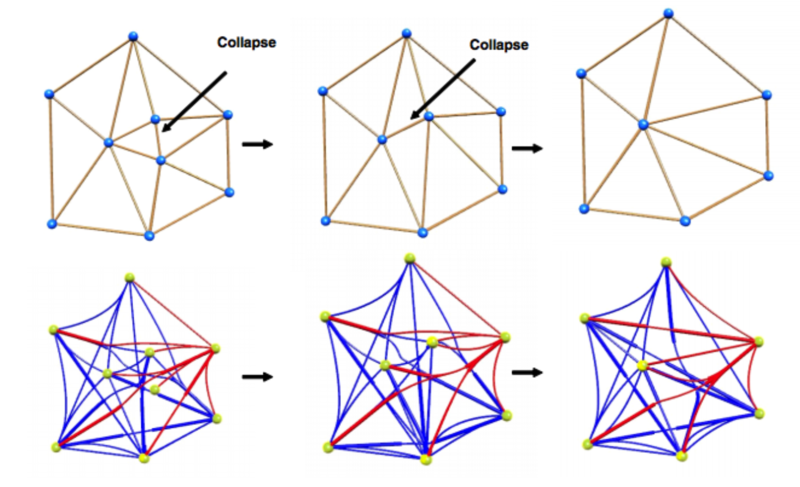 Rather than keeping a static structure, networks often vary in time: nodes appear and leave, relationships emerge and fade away, communities merge and split. 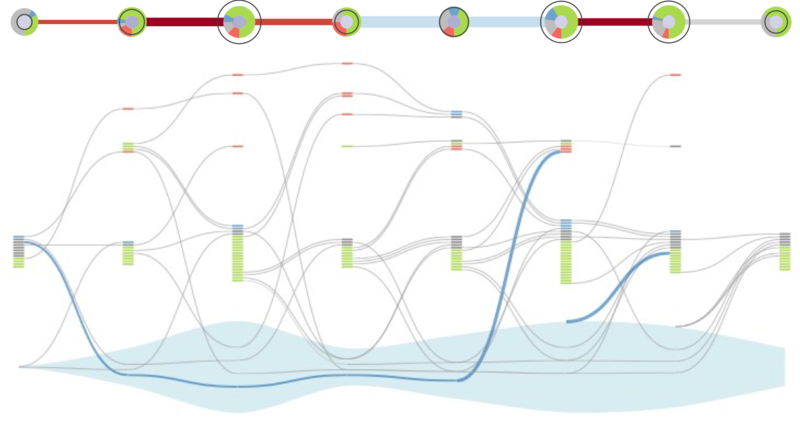 We present several visualization methods to analyze the complex network evolution process. 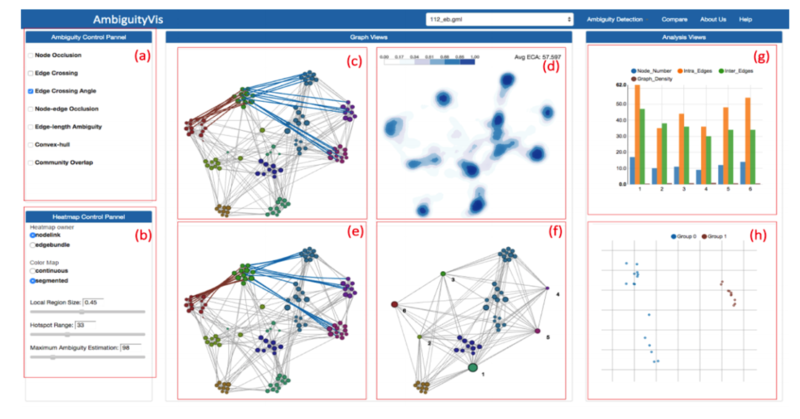 We present egoSlider, a visualization system for analyzing dynamic ego-network data, which incorporates a number of new visual encodings with three interactive visualization views to address ego-network analytical questions across different levels. We propose a general framework, namely the 1.5D visualization, for displaying and analyzing egocentric dynamic networks. We show that the 1.5D approach can effectively guide a user in the analysis process of egocentric dynamic networks. We propose three efficient strategies to map the multiple attributes of information propagation graph to appropriate visual elements. We also present a novel method by combining the traditional scatter plot with Hough transformation to represent the distribution of propagation instances and trace the propagation speeds. The data and objects in the real world can be of multiple types, forming complex heterogenous networks. 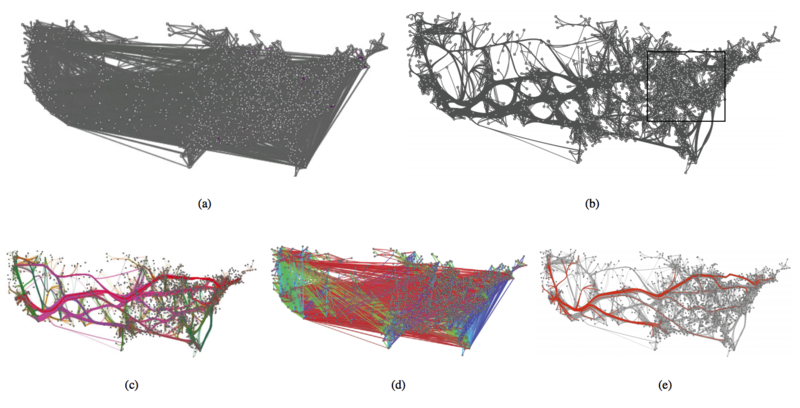 However, common network visualization methods only focus on homogenenous networks which fail to distinguish differenting types of nodes and links in networks. 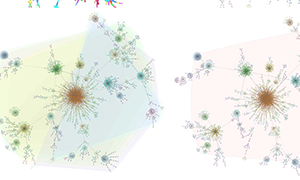 Our works reveal the hidden information in heterogenous networks. We propose a visualization framework designed for the micro-exploration and detailed analysis of relations involving a graph and a set. Our system consists of two major components: an enhanced graph view and a radial view. We proposed two visual designs for the visual analysis of set relations in a graph. 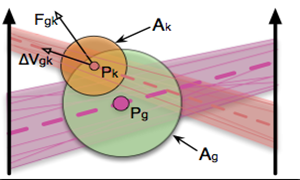 The visual designs can be applied to analyze the set relation in the context of the social graph and the set relations in the context of item clusters. 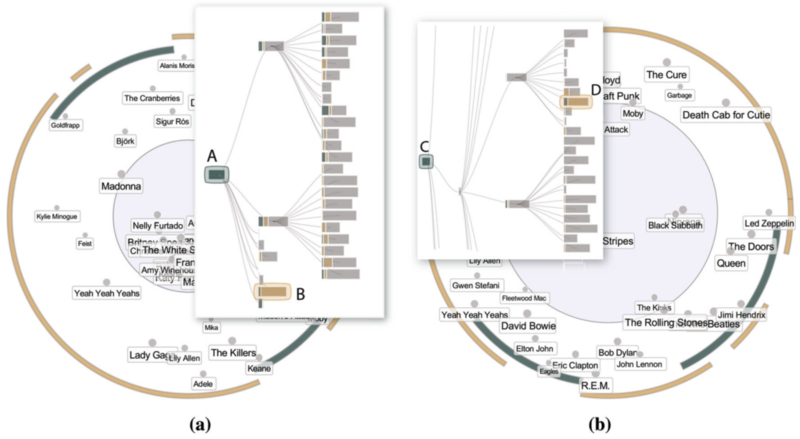 We present FacetAtlas, a multifaceted visualization technique for visually analyzing rich text corpora. FacetAtlas combines search technology with advanced visual analytical tools to convey both global and local patterns simultaneously. Understanding complex high-dimensional datasets is an important yet challenging problem. Problems like clutter, performance, information loss, and limited cognition hinders people from gaining knowledge in large and complex data. Our methods aim to solve these issues by leveraging the power of visualization techniques. we introduce a novel technique to visualize parallel coordinates with data labels and to use different labels to provide cues for the differentiation of polylines. We exploit curved lines and adjust their shapes according to an energy model to save space for visible labels. We present DICON, an interactive icon-based multidimensional cluster visualization. It provides a novel approach to visual cluster comparison, interpretation and adjustment. Compared with traditional visualization techniques. We present a novel parallel coordinates design integrated with points (Scattering Points in Parallel Coordinates, SPPC), by taking advantage of both parallel coordinates and scatterplots. Our scheme is more efficient than traditional multi-view methods in performing visual analysis task. We propose a novel splatting framework for clutter reduction and pattern revealing in parallel coordinates. Our framework consists of two major components: a polyline splatter for cluster detection and a segment splatter for clutter reduction. We present a novel framework to reduce edge clutter, consequently improving the effectiveness of visual clustering. We exploit curved edges and optimize the arrangement of these curved edges by minimizing their curvature and maximizing the parallelism of adjacent edges. We have two papers accepted by IEEE VIS 2015 (TVCG Track) at Chicago, USA. VisNexus is a series of visualization projects aiming to improve our understanding of the complex relations among data entities, which is conducted by the VisLab at Hong Kong University of Science and Technology. The HKUST VisLab is a multidisciplinary group aiming at improving the visual analysis and various visualizations. © Copyright (C) 2015 All Rights Reserved.